Can Intel take the smartphone fight to ARM? Can the Atom really make an impression in the smartphone market? Intel's 'Medfield' Atom chip has been a long time coming, and we first reported on its announcement back in February 2011 after Mobile World Congress. 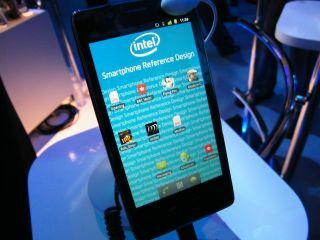 Now we know it's called the Intel Atom Z2460, and is at the heart of the new Lenovo K800 smartphone released today at CES 2012. After falling behind ARM in the chase for mobile supremacy, Medfield represents Intel's intention to challenge the market with a new kind of processor. It's a single core chip based on the more familiar Atom processor, which is more commonly found on netbooks, and nettops, offering low power at a low cost. Medfield is an evolution of Penwell, sharing most of the architecture. The processor market has thrived on the message that 'more cores equal more power' and with dual-core smartphones now the norm, and quad-core tablets being released throughout 2012, many will baulk at Medfield's single core announcement. However, there's more to Medfield than meets the eye. Low power consumption is a huge part of Intel's intentions with the Atom Z2460, and the ability to deliver long battery life, without sacrificing performance, is a key factor in the success of any mobile processor. By opting for a 32nm architecture - which is the world's first on a smartphone - Intel believes it can deliver the efficiencies its rivals can't. The company boasted that Medfield enjoys a 10x lower power leakage than its 45nm rivals, which include the ARM licensed Qualcomm MSM8x60 Snapdragon and Texas Instruments OMAP 4, but still larger than the forthcoming 28nm Cortex A7, which is slated for early 2013. Power and battery life have been huge issues for mobile chip makers, and each has come up with different ways of managing what has become a major complaint for consumers. ARM's Cortex A7 processor uses a Big.LITTLE concept of running two chips - one powerful, one efficient - and switching smartly between them depending on the task undertaken by the handset. Medfield uses a dynamic range of power states, throttles processor speeds as and when they're required, with fine grained steps at 100MHz increments. 1.6GHz speeds are only achieved in short 'burst modes' for the most demanding tasks. Intel says this range of speeds enables it to keep power consumption lower than its rivals. Being derived from a PC processor means that Medfield is the first x86 processor, which brings about a whole new set of challenges for Intel. The first challenge is app support, since the Dalvik and NDK apps found on the Android Market, for example, aren't designed to work on x86 chips. Intel has promised 90% app support when Medfield phones hit the shelves, and have been busy turning apps into Medfield-compliant programs. The company promised that consumers wouldn't notice any difference, and that Medfield smartphones wouldn't have to be annexed to a separate x86 Marketplace. The single-core Intel Atom Z2460 chip is clocked at 1.6GHz, with 512KB of L2 cache memory, which is far faster than the 1.2 GHz Cortex A9 found on many the hero devices of 2012, such as the Samsung Galaxy S2. Intel deflected questions about Medfield's single-core architecture, pointing at other innovations, which help keep performance up with its rivals. Hyperthreading capability is found on Medfield, much like Intel's lauded full-form PC chip Sandy Bridge, which mimics a dual core chip by enabling the core to work on two processes simultaneously. This speeds up the work done by each core, meaning that processes can be completed quicker, which is really noticeable during video encoding. Any software must have threads written into the code for a processor to take advantage, and it will be interesting to see where Medfield can gain the biggest performance advantages. While Android's core apps could be engineered to make use of Hyperthreading, it's not clear whether third-party apps will be, and this is something to look for as the system develops. One cause for concern, however, is that the Intel Atom Z2460 can only handle a maximum screen resolution of 1024 x 768. With an industry focusing on screen quality, this leaves very little headroom for growth. And as the Samsung Galaxy Nexus already features a screen at this resolution, don't expect to see Intel-based smartphones exceeding this. TechRadar was treated to an exclusive preview with a reference handset running the Medfield chip at Intel's Santa Clara headquarters, where the company ran benchmarks against leading handsets. We'll be holding back judgement until we get the chance to review the Medfield platform ourselves, but Intel's boasts were backed up by an impressive showing in early tests. The reference handset was 3x faster in BrowserMark than the Samsung Galaxy S2, which is exciting news for those looking to enjoy rich web experiences on their smartphones. Intel's benchmarks also recorded its Medfield system to use 50% less power in 3G mode than the iPhone 4S, which has suffered from complaints over battery life. Battery life seems promising, with Intel claiming 26 hours from the reference handset - a figure that's 10% better than the Samsung Galaxy S2. One of the most exciting Intel demos, however, was the playback of 1080p media from the handset onto a large external display. While high-definition video is promised on many handsets, the reality can be playback with is jumpy at best, and impossible at worst. The Medfield reference phone played 1080p video back seamlessly, even while connected by HDMI.